This notorious forgery, "A Synthesis of the Russian Text Book on Psychopolitics," originally published in 1955 and falsely attributed to Lavrentii Beria, the Chief of Stalin’s Secret Police, was actually written by science-fiction novelist and Scientology founder, in 1953, L. Ron Hubbard (1911-1986), who had a flair for creating pure fantasy worlds, including a fantasy religion-for-fee, and, apparently, fantasy politics. Until recently, American politics has rarely been more psycho. Brain-Washing... purports to reprint a secret Soviet textbook and speech by Beria on mass mind-control techniques. Among the document’s many astounding claims is that “every chair of psychology in the United States is occupied by persons in our [Communist] connection.” Hubbard distributed the pamphlet to law enforcement agencies, and the forgery was sufficiently sophisticated to be taken seriously by President Eisenhower’s National Security Council. "We could not help remembering that Siberia is very near Alaska and since it is obvious no one needs such a large land grant, we were wondering if it could be an American Siberia." For former Governors of the state with failed larger ambitions, perhaps, but there was a precedent for internment of U.S. citizens during wartime - and this was a war on Communism - so the American Public Relations Forum, while engaging in pretzel logic, was not completely irrational in its concern. Whether this pamphlet was part of the APRF's campaign against the Alaska Mental Health Enabling Act or not (its initial printing was issued a year before the controversy; subsequent issues may have had that purpose), it stands on its own as one of the most bizarre titles in the annals of American Right-Wing literature, and a testament to the imagination of a grade-z fringe writer who developed his gift of BS for the credulous into a breath- and wallet-taking pseudoscience psychobabble aliens-from-outer-space-our-spiritual-leaders creed that raised him to the status of America's most celebrated - and wealthy - charlatan of the twentieth century (but don't say that to a Scientologist). Curiously, the electropsychometer (E-meter), Hubbard's quack contraption that he claimed could measure the pain felt by an eggplant and plays an important role in identifying the Scientology novice's psychological issues, is no where to be found within this book. What's brainwashing without a top-loading automatic washing machine? [HUBBARD, L. Ron]. Brain-Washing. A Synthesis of the Russian Text Book on Psychopolitics. 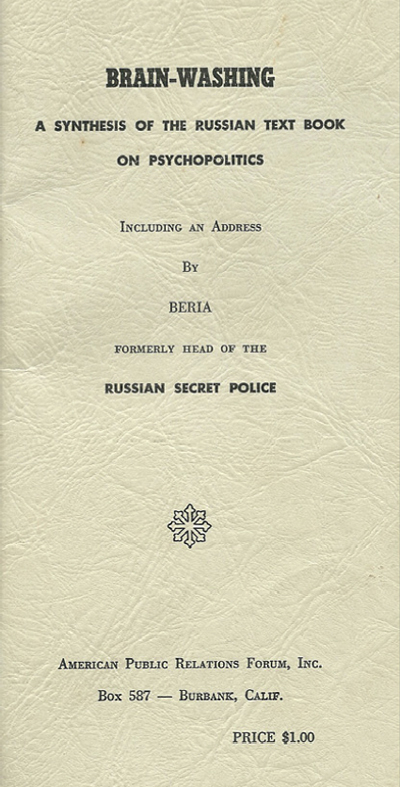 Including an Address by Beria, Formerly Head of the Russian Secret Police. Burbank: American Public Relations Forum, [ca 1958]. 56pp. Staple-bound, textured buff wrappers, printed in black. Image courtesy of Lorne Bair Rare Books, with our thanks. Scientology, Inc. has always had a thing for "psychs." Their Citizens Commission on Human Rights is a Scientology front group devoted to bringing down and discrediting mental health professionals - with their traveling "Industry of Death" display. Lisa McPherson died because her Scientologist friends thought they were helping her by not allowing her to receive mental health care. Hubbard hated 'psychs' perhaps because they're the ones who could point out his insanities, and because they saw through his drama when he was in the service. So it doesn't surprise me that in the context of the year this pamphlet was published, Hubbard would try to make people believe that somehow mental health professionals were communists. Like it or not, Scientology groups including the Citizens Commission on Human Rights have successfully campaigned against mental health abuses for years: ECT, Psychosurgery, 'Deep Sleep' treatment, use of black 'mental patients' in South Africa as slave labour, and more recently drugging of children and elderly patients. I know because I worked on a lot of those campaigns. More interesting however, in relation to your book review, Hubbard's 'Science of Survival', a Scientology text published in 1952, was the first publication to reveal the existence of the CIA-funded ('MK Ultra') Mind Control programmes. These were only admitted in the late 70's when US Freedom of Information documents obtained by Scientology researchers documented the full story. Pain-Drug Hypnosis, aka brainwashing, was being researched by psychiatrists in some US and Canadian hospitals. It was nasty stuff - see 'The Manchurian Candidate' for a fictional but well-grounded representation. The associated threat of the 'SIberia Bill' was not imaginary, and we should all be glad it was defeated.